Amid fierce fighting, ISIL fighters remain squeezed in a few hundred metres in besieged Baghouz village, SDF says. Asmar al-Bahr says he saw scores of bodies strewn across ISIL‘s last encampment in the eastern Syrian village of Baghouz and stockpiles of weapons. However, it was the “suffocating smell of death” that he worries he may never forget. Bahr is a photographer with the Syrian Democratic Forces (SDF), the US-backed group fighting ISIL in Baghouz. He says he went to the village on Tuesday, hours after fierce fighting the night before. “I talked to several Daesh fighters,” he told Al Jazeera on the phone, using the Arabic acronym for the Islamic State of Iraq and the Levant (ISIL, ISIS). 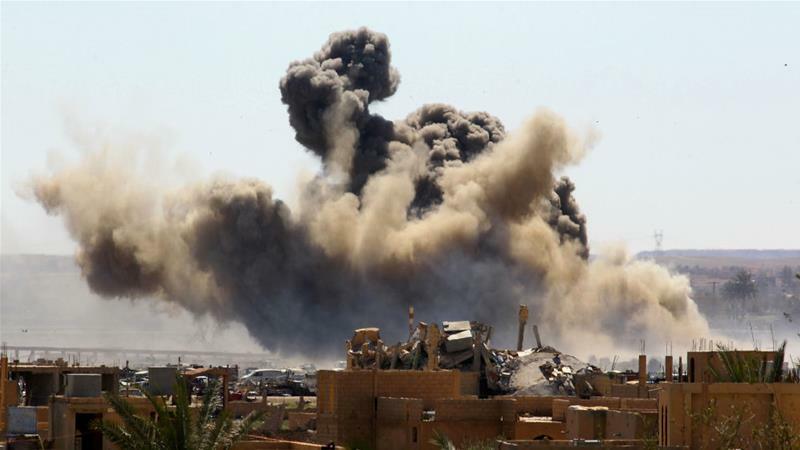 On February 9, the SDF began an operation to wipe out the remnants of ISIL from Baghouz in Deir Az Zor province, the group’s final holdout on the Syria-Iraq border. Since then, ISIL has been said to be near to defeat at any moment, any day, any hour. The operation undertaken this week has pushed ISIL fighters to the tiniest part of the sliver of territory it has been holding on to, SDF says. According to maps posted on Twitter by SDF spokesman Mustafa Bali, the remaining ISIL fighters and their family members are squeezed in a few hundred metres along a stretch of the Euphrates River. However, Bali urged caution against a premature declaration. “SDF is in control of Daesh encampment area in Baghouz,” he wrote on Twitter on Tuesday. A day later, US President Donald Trump appeared ready to declare for the second time victory over ISIL – the first being in December last year. Those left, he said on Wednesday, would be “gone by tonight”. Ahmad Sultan Abu Araj, deputy commander of Jaish al-Thwar, the Arab contingent with the Kurdish-dominated SDF, said on Thursday that Trump’s comments came too early. “The US president has said the same thing before and no liberation was announced,” Abu Araj said. In the commander’s estimation, there were still obstacles to cross and sometime before victory was announced. “The declaration would be by the end of March or the beginning of April, if nothing unexpected happened, after we make sure that Daesh is completely over,” Abu Araj said. Asmar, the photographer, argued that “there will be no announcement” for Baghouz’s “liberation” before “the full transfer of weapons and before SDF clears the area”. “There are lots of trucks in Baghouz to clear the dead bodies,” he said. Since the operation began, at least 60,000 people, mostly women and children, have left Baghouz and are now in the al-Hol camp in Hasakah in northeastern Syria. Thousands of ISIL fighters have been detained in makeshift prisons by the SDF. Those remaining in Baghouz are believed to be die-hard ISIL fighters, along with family members unwilling to surrender. The SDF has said its operation was slowed down to avoid harming women and children. According to interviews of SDF leaders previously reported on Al Jazeera, the delay has also been a result of negotiations between SDF and ISIL over the release of hostages – Westerners, Kurds and Arabs. But they have largely seemed to fail. Ahmad Sultan Abu Araj, the SDF’s Arab commander, said that there was no confirmed information about the hostages. “We haven’t had any information about the hostages, but if they were still alive then they would be used to apply pressure in the future. We still don’t know where they are. 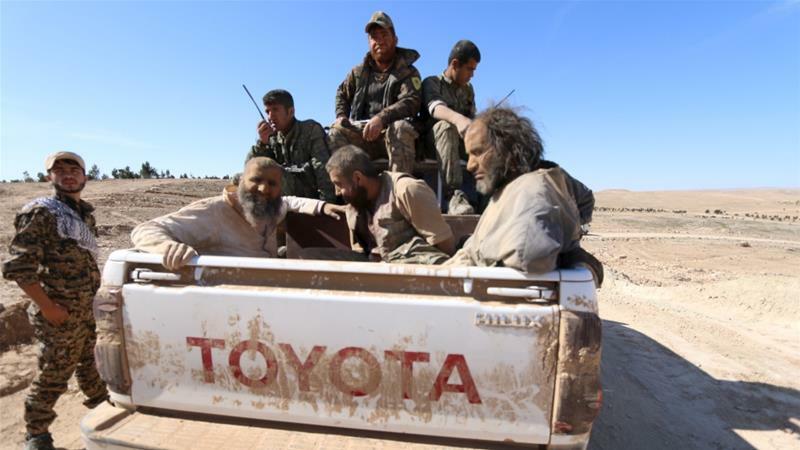 Maybe they are being held by ISIS leaders in the desert, or maybe they are dead,” Abu Araj said. These islam-infected females have babies ! These islam-fathered babies grow into islam-infected children !! These islam-infected children grow up to become ,,, islam-infecteds !!! … resulting in MORE planned nurtured islam-infecteds) !!! … as are the “Relief Agency” workers !!! … what more would you expect !!! aided abetted and assisted also via “Leftoid” islamophile-puppets controlled by their marxist/socialist/islam-infected masters) !! !